I had the honor recently of speaking at the Médecins Sans Frontières (MSF / Doctors Without Borders) Canada Annual General Assembly (AGA). While an international organization, each location has a very large group of people who work on decision and policy for their specific group for the year – usually in the AGA. These are three days of talks, debates, and dinners. The international group defines a focus for the discussions, but it’s up to each pod how they act around that focus. This year, it was how MSF is using (or not) technology. While most of the talks were internal, the bit of time I was there the topics ranged from telemedicine to social media in conflict zones. They asked I come speak about technology and disaster/humanitarian response. The gist of the talk I gave (15-minute video follows) is that technology is a means to more equality in the world – a way to be inclusive. That there are many people in the world who want to use their technical skills to help groups like MSF out, but we absolutely need them at things like hackathons. 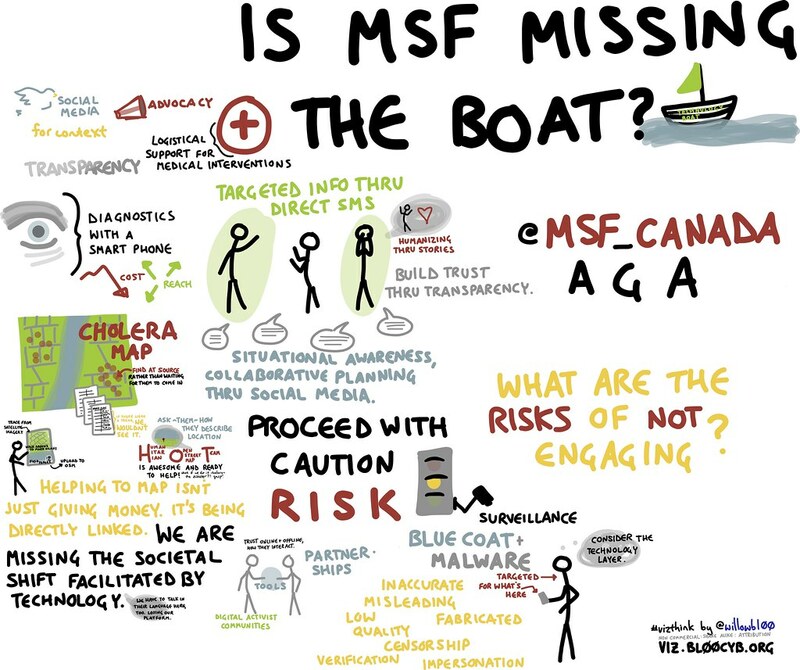 That there are many people with voices and connections to the globe now, and that groups like MSF have a responsibility to listen to them directly. And that technology, when done in codesign, will be aligned with what their needs are, and is an ongoing relationship, not a one-off delivery. Again, most all of the discussion happened behind closed doors, but I recorded my laptop and voice while I did my own presentation. It seemed to go pretty well. We’re keeping the conversation going, and I’m excited for more points of connection. You can follow the prezi at your own pace here, and see the full #vizthink for the panel here. The other exceptional panelists and myself advocated for F/OSS, especially in light of security, for inclusion. MSF is rightfully anxious about infiltration, ways to be transparent, and usability. Ivan and I re-emphasized open source communities, that people are committed to examining (and re-examining) code for backdoors and optimizations. That open source has been around for decades, that most technology is built upon it, and that it’s a way of performing mutual aid between countries and cultures. Someone asked in Q+A about using things like Facebook and Twitter in the field, if use could cause problems. Problems of location or images suddenly not being as private as you thought, and kidnappings and killings resulting. Or, what if things just get hacked by governments or by insurgents? My response was that MSF, with all their weight and influence in the world, has a duty to insist upon things like Coercion-Resistant design. Insist that these companies treat their customer bases humanely. For those of you who would like to show your support closer to home..
9a Saturday morning I’m giving my presentation on my honors paper in the Persimmon/Dogwood rooms of the IMU. It’s all of 10 minutes long with 5 minutes for questions.